Men are from Mars and women are from Venus, but the characters in director Punit Malhotra’s Gori Tere Pyaar Mein are so flat-out uninteresting, you have to wonder if they’re from another galaxy altogether. We’d have cared more about this mismatched couple had the makers invested in a sharper script. I am going with a generous two out of five for Gori Tere Pyaar Mein. It’s as enjoyable as drinking a cup of tea that’s been left out in the cold. The first hour of GORI TERE PYAAR MEIN! may give an impression that Punit Malhotra is back on familiar grounds urban setting, wittiness and styling. Punit does an about-turn in the second half. The writing has its highs and lows in this hour; it’s absorbing at times, but not making much of an impact intermittently. However, there’s no denying that the noteworthy moments outweigh the blemishes. You exit the auditorium with a feel-good sentiment and a smile on your face. On the whole, GORI TERE PYAAR MEIN! is a charming and refreshing coming of age film plus rom-com rolled into those 2.25 hours. The film maintains the right balance between amusement, hilarity and engaging moments. Recommended! Gori Tere Pyaar Mein! is fun as long as it sticks to the formula. But in the second half, director Punit Malhotra, misguidedly moves into Ashutosh Gowarikar mode. Meanwhile the narrative becomes both melodramatic and even more synthetic as Punit tries to inject emotions and a sense of nobility that hasn’t been earned. The best thing about Gori Tere Pyaar Mein! is Imran who maintains an easy charm, even when he’s adjusting to gobar and garibi. I’m going with two and a half stars. On the whole, Gori Tere Pyaar Mein! has an interesting first half but the post-interval portion, to a large extent, mars the impact because it does not go well with the first part. It has hardly anything for the single-screen cinema audience because the humour is more class-appealing. At the box-office, it will not be able to do much. If it still manages to sail safe, it will be because of recoveries from sale of satellite and audio rights. Its performance Overseas will be quite alright. Punit’s ‘GTPM’, is a sweet, breezy romcom with likeable characters presented in glossy, lavish, true Karan Johar (producer) style. In the second half, the ‘the bridge over troubled waters’ project is a bit stretched, and you wish the gaonwallahs would leave the pair to romance instead. Music (Vishal-Shekhar) is peppy and pleasing.This isn’t the most rousing romance (second-half lacks ‘rom’), but has its feel-good moments. Chew it up with some ‘Chingam’ and a cute date. It works as an idea – the idea of winning the girl back by changing yourself and empowering villagers – but it’s not new. Why, Lagaan is invoked on multiple occasions in the soundtrack and dialogue. But the execution and an absolute disconnect from reality work against the idea. Escapist songs, caricature secondary casting, and convenient screenplay solutions don’t help either. Punit Malhotra did alright with his easygoing, easily forgotten ‘I Hate Luv Storys’. Imran is quite the same here, not holding anything sacred or dear in that very with-it cool way and then letting loose on what he really thinks about fellow rich kids like him but with bleeding hearts. However Malhotra aims to be different without a difference here and his core audience suitably placated, he rambles onto that village and its – you guessed it – very ‘Lagaan’ ending. Bleeding hearts can be messy, especially when all you have been aiming for so far are handkerchiefs to dab some eyes. Gori Tere Pyaar Mein is essentially two different films separated by an intermission, with a few, weak common threads between the two. Gori Tere Pyaar Mein’s saving grace is that it is a love story and the second half will manage to melt your heart, if only slightly. It’s the classic opposites attract story and hey, if you’re into that kind of thing, this might be your kind of film. Generally speaking, ‘Gori Tere Pyaar Mein’ is a clean, light hearted and fun film but don’t go to watch it keeping your expectations too high. If you are sucker for Rom-Coms, especially the Karan Johar kinds, and if you have not watched a film in a long while, then chances are you might enjoy it. All in all, the story is weak. Direction is poor too. Had Puneet stuck to a different kind of film perhaps, one that catered more to generation Z’s rich tastes, then that film would’ve definitely fared better. Vishal-Shekhar have composed the music in the film, and when heard otherwise, the songs seem nice. Watch the movie if you have to, if you like to watch big stars on the big screen. For the rest, skipping this movie would be a wise decision. Firstly, if you are expecting a remarkable rom-com from Gori Tere Pyar Mein, then brace yourself for a big disappointment as the film is neither funny, nor romantic. In fact, it’s a break-up, patch-up saga that becomes extremely boring after a point of time. GTPM appears to be a half-hearted attempt. The movie ends so abruptly that may make you feel that even Punit Malhotra was in a hurry to finish the film. 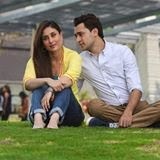 Imran Khan and Kareena Kapoor fans are requested to go and watch the film at your won risk. : It comes as a pleasant surprise when director Punit Malhotra has upped his standard by delivering a cutesy and enjoyable romantic comedy. Aided with the wicked chemistry of Imran Khan and Kareena Kapoor Khan, Gori Tere Pyaar Mein! conjures up a charmingly enviable romantic comedy which is delightful and breezy without an ounce of melodrama. The subtle cool candour isn’t novel but this run-in-the-mill story is exceptionally endearing. It’s painful. It’s drab. It’s unromantic. And, it’s anything but funny (even unintentionally).Punit desperately tries to nail the Karan Johar style of rom-coms by packing in the staple ingredients but he’s unable to tie it together. There are numerous songs and dances but none that are peppy enough. Many costume changes and dressed up backdrops, but none that leave us mesmerized. There are even attempts at being cheeky with Bollywood’s infamous romances by referencing lines/songs/moments, but none of the efforts are impressive enough.This one’s a no-brainer, really. Do not to waste your money on this movie.